Week 4 of the challenge asked the question, "Which ancestor would I most like to invite to dinner?" My answer is Barbara Karch Metz, my maternal second great-grandmother. I’ve had a great admiration for her ever since I learned that following the death of her husband in Germany, she boarded a ship with 6 of her children and headed to America. Here is her story. Born in Insheim, Rheinland-Pfalz, Germany to Johann Joseph March and Maria Barbara Pfalzer on 29 March 1820, Barbara was the oldest of four girls. At the age of 21, she married Joseph Henry Metz on 16 February 1842 at the Catholic church in Insheim. 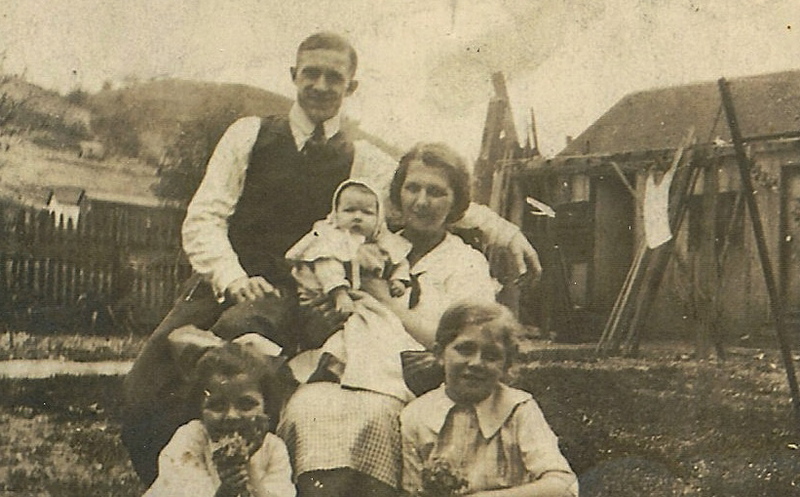 Barbara and Joseph had nine children, all of whom were born in Insheim: Nicholas b. 1842, Anna Maria b. 1843, Barbara b. 1846, Elizabeth b. 1849, Magdalena b. 1852 and died 1852, Joseph b. 1853, Rosina b. 1856, Johannes b. 1859, and Peter b. 1862. On 27 September 1862 Joseph Henry Metz died, reportedly from a bee sting. He was only 43, and my great-grandfather Peter was just four months old. By the next year the two oldest daughters, Anna Maria and Barbara, emigrated to the United States on the SS Borussia, a sailing vessel in the Hamburg-American Line. The ship arrived in New York on 15 July 1863. The sisters then made their way to Cincinnati, Ohio, possibly because their father’s brother, Adam Metz, was living there with his family. In 1866, Barbara and her remaining 6 children traveled from Insheim to Le Havre to board the SS Fulton, a paddle-steamer in the New York & Havre Company line. The journey would have taken around 14 days. Barbara was 47 at that time, and her children were the following ages: Nicolas-24, Elizabeth-18, Joseph-9, Rosina-7, Johannes-5, and Peter-3. From New York, Barbara and the children made their way to Cincinnati. Family lore has it that once Barbara and her family arrived in Cincinnati, they did not know where to go. So they all gathered around a Metz meat truck, hoping to get assistance. This Metz was not related to her deceased husband, but it was a name she recognized. I’m not sure if there is any fact to the story, but it is a fun one nonetheless. Barbara was 73 when she died in Cincinnati on 29 April 1893. If I had an opportunity to dine with Barbara, I would ask her about her husband Joseph’s death, and how the family survived in Insheim for nearly four years without him. I would want to know what it was like to leave the only town she had ever known, and what relatives were left behind. What was the voyage by ship like? How did they get to Cincinnati from New York - train? What did she think of her new country when she arrived in Cincinnati? Did they really sit by a Metz’s meat truck hoping someone could direct them in their new city? And finally, I would want to tell her how amazing I think she was for giving up her life in Germany to hopefully provide her children with a better life in the United States. Longevity is the prompt for Week 3 of the writing challenge. This prompted me to dig into my family tree to find the ancestor who far exceeded the average life expectancy at the time of death. So while I have ancestors who were older when they died, and in fact have aunts who are still living in their 90s, I am intrigued by my paternal second great-grandfather, Johann Heinrich Berhard Boegel. He was 83 when he died in 1920, but according to a study from the University of California - Berkeley, the average life expectancy for a male in the United States in 1920 was 53.6 years. He exceeded the average by nearly 30 years! Johann (sometimes going by Henry, other times as John) was born on 1 March 1837 in Lengerich, in the Kingdom of Prussia to Frederich and Christine Boegel. 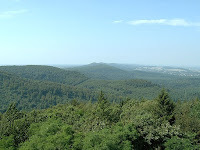 The area became part of Germany in 1871. 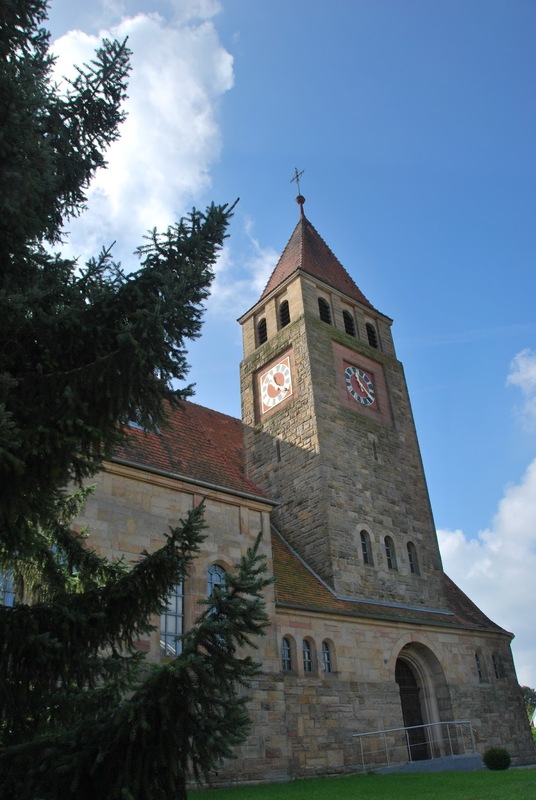 Established in 1147, Lengerich is located about 30 km northeast of Münster in North Rhine-Westphalia, and is small community situated on the southern slope of the Teutoburg Forest. When he was 21, Johann traveled alone to Bremen, a distance of 139 km, where he boarded the SS Auguste for passage to America. 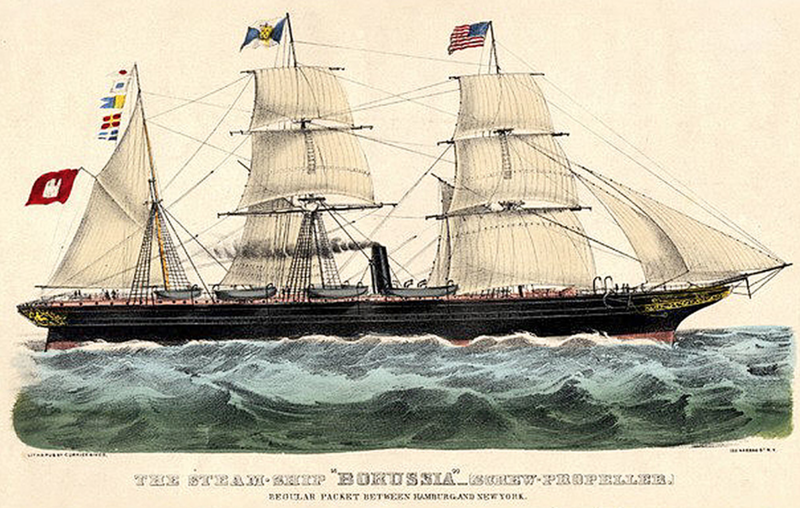 The Auguste was built for the Bremen shipping company E.C. 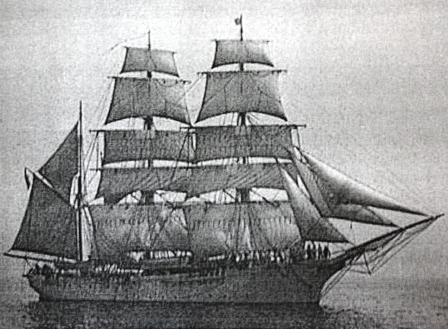 Shramm and Co., and was launched on 2 November 1850. The ship could carry 358 people. The Auguste was most likely a sailing ship as it was not until around 1865 that more emigrants traveled by steamship than sailing vessels. The average length of the voyage would have been around six weeks. The ship's master on Johann's journey was Henry Ehrichs of Bremen, who guided the ship into the port of Baltimore on 20 July 1858. Johann indicated on the ship's passenger list that he was a farmer, and his intended destination in the United States was Cincinnati. Despite traveling over six weeks from his home in Lengerich to Baltimore, he still had to navigate his way from Baltimore to Cincinnati. That is a distance of over 500 miles, which he most likely accomplished by train. On 26 November 1858, Johann married Sophia Elizabeth Suhre. 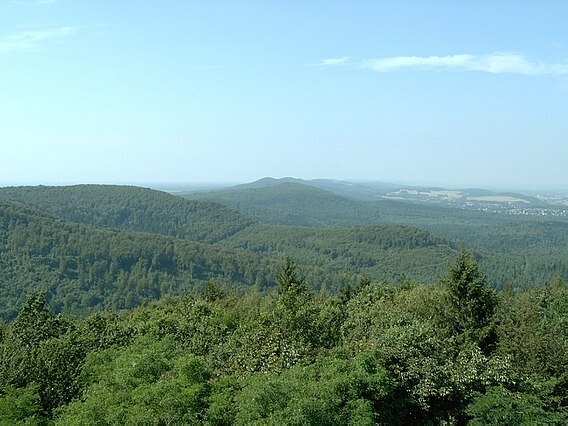 Sophia was born 26 March 1837 in Lienen, Westphalia, a small village located only 9.7 km away from Lengerich. Did the young couple know each other back in Prussia? It certainly seems interesting that less than four months after his arrival in Cincinnati, Johann was getting married. The wedding ceremony was performed by F.M. Raschig, pastor of St. Matthaeus, a German Evangelical church located on Elm Street between 15th and Liberty Streets. This part of Cincinnati was referred to as Over the Rhine due to the huge influx of German immigrants settling in the area. The couple resided in the 500 block of Elm, and Johann quickly established himself as a grocer. By the 1880 census, he listed his occupation as "grocery and saloon". Johann and Sophia had the following children: Johann Heinrich (Henry), William, Emma, Louisa (my great-grandmother), Matilda, John Henry (John), and Charles. Sophia died on 4 December 1891 of chronic bronchitis. She was 54 years old. In the 1910 census, Johann was living with his daughter Emma and her husband, and at 73 years of age he was working as a porter in a saloon. The record also indicates that he became a naturalized citizen in 1865. By the time the 1920 census was taken in January, Johann resided at the Hamilton County Home. Two months later, on 19 March 1920, he died at the age of 83 of prostate enlargement. Today the diagnosis likely would read pancreatic cancer. He was buried 22 March 1920 in Raschig Cemetery, today also known as Baltimore Pike Cemetery. What was it about Johann that enabled him to live such a long life? He had been widowed for 29 years at the time he died, and five of his children predeceased him. Hopefully it wasn't the fact that he was widowed that kept him going! Was it owning his business for so many years? Continuing to work into his 70s? Even more intriguing - if he hadn't developed a problem with his prostate, could he have reached the age of 90? This week's writing prompt is Favorite Photo. That is certainly short and to the point, but wow! Which photo should I choose? After my father died in 2004, I inherited the photo books that he and my mom had put together throughout the years. Some of the photographs I have scanned and filed on my computer, so I searched through those for inspiration. I picked the one that made me smile as I received some less than desired health news this week. This photograph was taken at our home in Chicago about 1958. My father had purchased a Lionel train set for his oldest son, probably in the late '40s. My older brother Roy had aplastic anemia and was quite sickly. I think dad got the train to cheer him up. Though Roy died in 1950, five years before I was born, dad continued to add to the train set over the years. There was a second train, and while I don't remember the brand name, all of the cars were made of silver metal. By the time we moved to Des Moines in 1960, a ping pong table in the basement provided the perfect base to set up tracks, buildings, tunnels, people and animals, trees, etc. The trains were not left up year round, so it was like discovering a new toy every time dad set them up. What I love most about the picture is the sheer joy on my face. My dad worked hard to provide for my mom and my three siblings, so to have him down on the floor playing with us such a treat. I think he got as big a kick out of the train sets as we did, though he certainly must have experienced some moments of sadness each time he put them together. 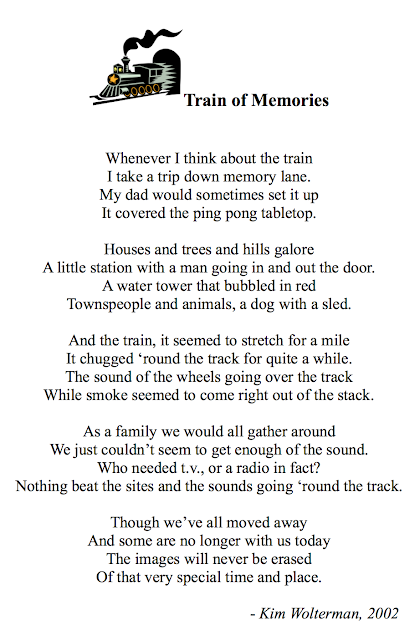 After I read the poem aloud, it was amazing how many parents came up to me to reminisce about their childhood train sets. Apparently I wasn't the only one who carried childhood train memories in their heart. And isn't it wonderful to have photos that can transport us back to a different time and place? This year I am going to shift my weekly posts from a focus on my memories and the Family Search 52 Stories project to stories about my ancestors. A Facebook post by the Hamilton County Genealogical Society brought my attention to the 52 Ancestors in 52 Weeks challenge. Amy Johnson Crow started the challenge several years ago in an effort to encourage genealogists to write and share information about their ancestors. Very general writing prompts are provided for the 52 Ancestors challenge. For the first week of 2018, the prompt is Start. Obviously that leaves the door wide open in terms of what I can write about. Do I want to start with me? Or how about starting with the oldest person alive in my family? Or perhaps the person farthest back in my family tree? As I pondered these questions, I decided to write about how I got started in researching my ancestors. Like most people, I remember hearing my older relatives talk about growing up, telling stories about their parents and other people in the family. Also like most people, I paid little attention to what they were discussing. It seemed boring to me as a child. One of my cousins, however, got interested in genealogy while in her 30s, and drew up a small family tree of the Crusham family. This was way before the computer provided much help in the way of charts, and long before the Internet offered meaningful information to family historians. She researched the old-fashioned way, pouring through old records at the local repositories. My mom gave me a copy of the tree in July of 1989 when she and my dad stopped at our house on their way to visit my brother in Colorado. That was the last time I saw my mom alive as she was killed in a car accident on the way home from their Colorado trip. Suddenly I realized that an important link between me and my ancestors had been severed. I could no longer ask my mom questions about growing up, her parents, or what it was like to be a new mother alone when her husband was sent to the China-Burma-India Theater during WWII. How I wished I had listened more closely to the stories when I was young! 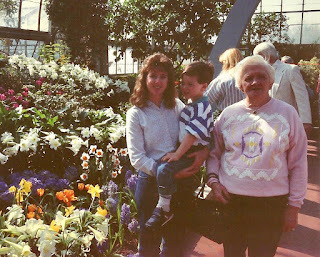 In 1989 I was 33 years old with a son who was 4 and would grow up not remembering the most important woman in my life. 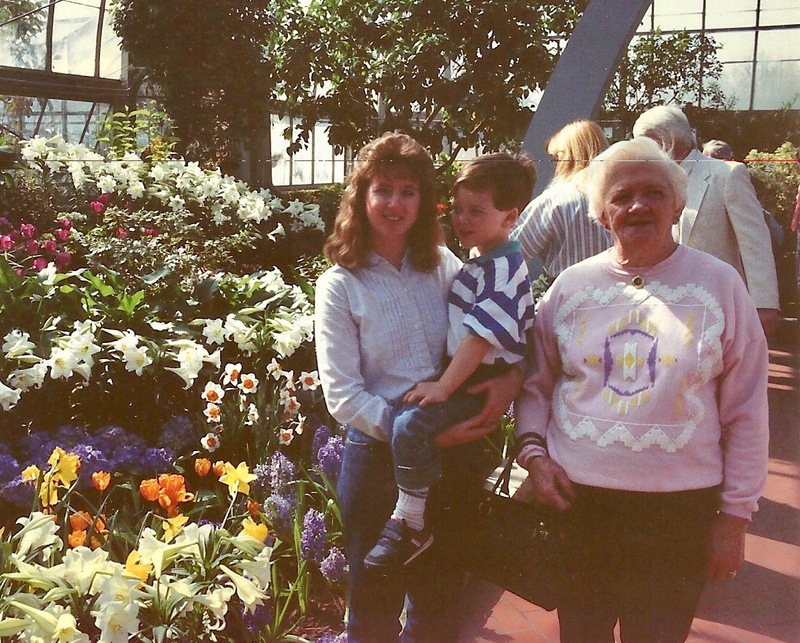 with my mom in April of 1989. My mother's death sparked in me a desire to actively research my family while other, older members of the clan were still alive. I have picked their brains, listened to their stories, and done my best to document where we came from. I've had the privilege of visiting a few ancestral towns abroad, meeting distant relatives along the way. Most of all, I've gained a greater sense of who I am, due in no small part to the tenacity and sacrifices made by my ancestors. As a side note, it is fitting that this post is being made on January 6th, which would have been my mom's 98th birthday. Happy heavenly birthday, mom!